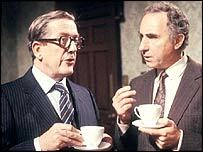 Much was said about business' opinion of Cameron's EU veto in the immediate aftermath of this month's summit but, now that the dust has settled, the picture is starting to become much clearer. Today, in a letter to the FT, orchestrated by Open Europe, 20 leading business figures express their support for Cameron's veto and his willingness to "stand up for an outward-looking and competitive Britain." Sir, It is impossible to know just how European politics or economics will develop at this juncture. 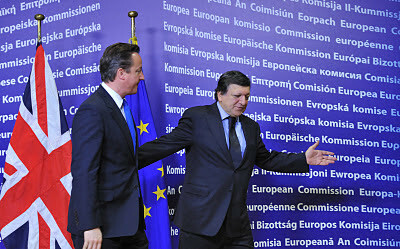 However, since the UK prime minister’s recent veto of a new European Union treaty, one major point of principle is clear: Britain does not want, or intend, to be dragged deeper into a more centralised and over-regulated EU with ambitions to become a political union.We therefore believe that David Cameron deserves the full support of the business community. On this occasion, he was seeking safeguards for the financial sector, still one of Britain’s biggest industries, employing more than 1m people and contributing more than £50bn in tax revenues, but the principle is applicable to many other sectors of our economy, including manufacturing, which employs more than 2.5m people. Those who would portray Mr Cameron’s use of the veto as bad for jobs and growth or as leaving the UK “isolated” are mistaken. The real threat to employment is the euro crisis, which was unaffected by his veto and which the recent summit did little to address. Britain has great potential to compete across the globe, if freed from badly targeted and trade-hampering government intrusions, whether from London or Brussels. Irrespective of the fate of the euro or the ability of weakened southern European economies to prosper under severe austerity programmes, it is most welcome that the prime minister has shown himself willing to stand up for an outward-looking and competitive Britain. Meanwhile, an IoD poll has revealed that 77% of its members agree with the PM’s use of the veto, with only 19% disagreeing. The survey found that 63% of IoD members would like to see the UK in a looser relationship with the EU, including 42% who would like to see a repatriation of some powers. Add to this our recent poll of financial services managers, before the summit, which showed that 69% supported the introduction of a British veto on EU financial rules even if it reduced access to the Single Market, and the picture is one of widespread business support not only for Cameron's veto but for a more liberal and competitive Europe. 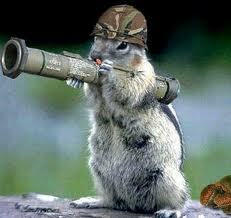 The Coalition has itself admitted that “lessons need to be learnt”. We would agree. Open Europe has today published a new briefing setting out the ten lessons that should be learnt from David Cameron’s ‘veto’ of a proposed EU Treaty change at the summit of 8-9 December. By accident or design, the UK Government has set down a marker for future negotiations. It is prepared to use the veto. It remains unclear what theconsequences of this initial veto will be. However, as moremember states show their reluctance to sign up to the new Franco-German-eurozone deal in its entirety, the initial dramatic portrayal of an isolated Britain was clearly premature. 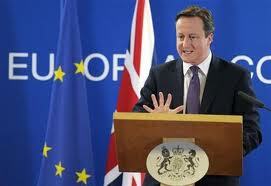 The Government was far too slow to react to the prospect of a series of EU Treaty changes to bolster the eurozone. The Government gave the impression that it left its requests to the last minute despite having over a year to prepare. The Coalition needs to start thinking now about not only the next potential opportunity but the one after that. The UK failed to prepare potential allies and crucially failed tocorrectly gauge the likely reaction of German Chancellor Angela Merkel. There was clearly a breakdown in communication and understanding leading up to the summit with no time being given to explain the UK’s requests. The UK needs to improve its preparation for negotiations using all the resources available to it. The Coalition needs to set out a coherent narrative prior to summits in an easily understandable form. The UK was secretive and this made it easy for others to portray the UK’s requests as ‘special pleading’ for the City of London when in fact the UK was also seeking for the right to impose stricter regulation on banks than the EU standard. The UK should have emphasised its desire to protect the Single Market and the UK taxpayer. There was clearly a failure to understand the changing mood in Berlin. Next time the UK will need to have a more intelligent method of understanding the thinking of key decision makers as well as natural allies so it can pitch its requests at the appropriate level and in the appropriate manner. The UK needs to ask for the right things at the right time. The UK’s requests at the summit were modest but some of the very technical demands were not appropriate for a discussion on EU Treaty change. 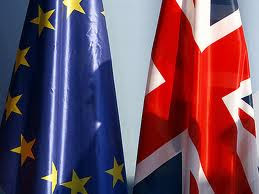 It is evident that the UK has for a long time failed to articulate a strategicplan to further its interests in the EU. The UK must develop a long termstrategy based on the realisation that it will not join the euro but that othereuro states might well seek to work more closely together. The UK wasted a lot of goodwill and political capital lecturing EU leaderson how to solve the eurocrisis in the run up to the summit. As the UK was not going to contribute to a plan to ‘save the euro’, this advice was not welcome and merely wasted political goodwill. In particular, the UK’s public support for greater ECB intervention was always likely to antagonise Germany. The UK needs to do better at prioritising when to use its political capital andunderstand the sensitivities of other countries. The UK political class, more than in any other EU state, uses the EU as a party political football. This creates a polarised debate at home and ties the hands of UK politicians abroad. The UK should do more to engage its MEPs and its staff in the EU institutions with a national strategy based around the UK’s strategic interests. It was not clear who was in charge of the UK negotiations, with officials from the Foreign and Commonwealth Office (FCO), Number 10, and the Treasury all keeping each other in the dark. The Coalition needs to make itsdecision making processes clearer. The key UK institutional relationship in the negotiations was between the FCO and the Treasury. It is clear that this relationship broke down. This needs to be repaired so that all parts of the Government are signed up to the same strategy. The Treasury also needs to learn to engage with and better understandthe mechanics of the EU. This morning saw the first allotment of the new unlimited three year ECB loans - the much hyped mechanism that some hope will solve the eurozone crisis by actually providing cash to struggling eurozone banks with which they can then use to buy Portuguese, Italian, Irish, Greek and Spanish debt, giving these countries some breathing space. Banks demand for these new loans shattered almost all expectations, coming in at €489bn (from 523 banks), compared to an average estimate of around €300bn beforehand. In the run up to the operation there had been much debate over whether this was a ‘back-door’ bailout by the ECB or its version of ‘Quantitative Easing’. Christian Noyer Governor of the Banque de France even termed it the ECB’s bazooka (for our recent briefing on this see here). With all this in mind one would expect a euphoric reaction from financial markets – unfortunately that doesn’t seem to have been the case. There was naturally some initial boost, but stock markets have settled quickly with some European markets even down slightly, while peripheral bond yields have continued their upward rise. - The actual boost in liquidity is only €210bn, since the rest is moved from some of the ECB’s other shorter lending operations, so any knock on effects it does have are likely to be limited. - Banks face a huge task to reach the 9% capital requirements laid out by the European Banking Authority (EBA), even with this extra liquidity banks are still going to be tempted to undertake significant deleveraging (reducing lending) to meet these requirements. - Banks face huge amounts of debt which needs to be rolled over or paid off, this is far from covered by this extra liquidity. - It is unlikely that much of this money will be funnelled back into sovereign debt (thankfully) since banks still face huge scrutiny over their exposures to the eurozone crisis, while any such investments would have to be hedged (the risk would have to be accounted for) - both of which decrease the value of such investments. - Some of this money may filter through to boost lending by banks to the wider economy, but given some of the constraints above this is far from certain. - Reports suggest the ECB has already begun purchasing Italian and Spanish debt to keep yields down this afternoon, a role which many expected banks to be playing once they were flush with all this new liquidity. So, still plenty of concerns and questions for financial markets to ponder despite the big uptake in this morning’s lending operation. Even if all of this money were used to purchase sovereign debt by banks it would not help solve the crisis. Not just because it would load under capitalised banks with risky sovereign debt (hinged on huge political uncertainty) but also because it only represents a short term liquidity boost. Sure, it might help Italy and Spain rollover a few billion in debt a bit more cheaply, but it does nothing to tackle the underlying problems of the crisis (lack of competitiveness and growth to name but two) nor does it help the already insolvent bailed out states. In the end, the pressure is still on for eurozone leaders to find a comprehensive intergovernmental solution, they must take the lead, the ECB and the banks cannot. A reconstruction by the Financial Times of what happened at the EU summit on 9 December reveals that it wasn't only a classic Franco-British dispute which raised the tensions of the discussions. Sarkozy went on to rebuke Helle Thorning-Schmidt, the freshly elected Danish prime minister, for the temerity to speak up for a deal at 27. “You’re an out, a small out, and you’re new. 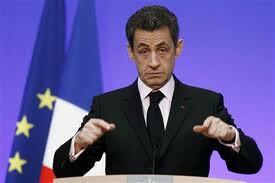 We don’t want to hear from you,” Mr Sarkozy said. It's not a secret that France has never been too happy with either the EU's internal market or the 2004 enlargement, a view forever symbolised in the notion of the "Polish plumber." Sarkozy's latest outbursts suggest that the French government is not only once again looking to further its old agenda of a smaller, more centralised and more protectionist union but that he is personally starting to feel the heat. The elephant in the room is the upcoming French presidential election. L'Express carried a headline recently noting that French far-right leader Marine "Le Pen is riding the wave of the debt crisis and the euro" with some polls putting her on 20% for the first round of the election, to be held in April. As opposed to her father, who made it to the second round of the Presidential election back in 2002, she's not just running with an anti-immigration message but also rallies very firmly against the euro, something that wasn't on the political agenda in 2002. 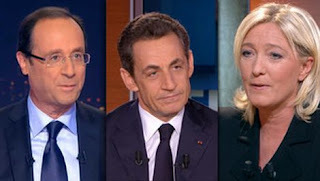 Polls show that Sarkozy is currently expected to gain around 25% of the vote in the first round, while the socialist candidate François Hollande is a few percentage points ahead. Since April is still some time away and the euro crisis can still take many turns (including France losing its triple A rating) the French press is starting to realise that there is a serious danger that a Le Pen could again make it to the second round. Open Europe has today published a briefing arguing that the ECB is unlikely to buy the hundreds of billions worth of government bonds required for it to properly backstop the eurozone, following an underwhelming agreement between EU leaders at the summit of 8 and 9 December. However, Open Europe notes that, contrary to popular opinion, the ECB is already heavily intervening in markets. Through its government bond buying and liquidity provision to banks, we estimate that the ECB’s exposure to weaker eurozone economies has now reached €705bn, up from €444bn in early summer – an increase of over 50% in only six months, raising fresh questions about its credibility, independence and possible losses it may face in the case of future sovereign defaults. The briefing also notes that other suggested options for boosting demand for sovereign debt – such as the newly announced three year long term refinancing operation (LTRO), due on Thursday – while helping to stem the short-term funding crisis, would also come with the risk of incentivising a weak banking sector to stock up on risky government debt. The ECB would also struggle to conduct ‘Quantitative Easing’ (QE) in the same vein as the Federal Reserve and the Bank of England as any QE would have to be spread proportionately around the eurozone, meaning that Germany would be subject to greater effects of any QE than Italy. Open Europe concludes that there may come a day when the ECB has no choice but to intervene on a massive scale. However, if so, that will likely be a stop gap on the path to a new, slimmed-down eurozone, and probably following the default of at least one eurozone member. - As things stand the ECB should not, will not and cannot provide the unlimited financial backstop to the eurozone that financial markets seem to be clamouring for. The measures taken at the EU summit on 8 and 9 December are unlikely to supply adequate cover for the ECB to buy the hundreds of billions worth of Spanish and Italian government debt needed to fulfil this role. - The ECB has taken on large amounts of low quality collateral in return for providing loans to banks, and has seen a massive surge in the number of asset-backed securities it has taken on to its balance-sheet. Though not all of these assets are bad or ‘toxic’, they are extremely difficult to value. At the same time, the number of banks which are becoming reliant on the ECB is alarming and hopes that the functioning of the European financial markets will ever return to normal are diminishing – creating a long-term threat to Europe’s economy. - Through its government bond buying and liquidity provision to banks, the ECB’s exposure to the PIIGS has now reached €705bn, up from €444bn in early summer. This is an increase of over 50% in only six months and shows how, contrary to popular belief, the ECB is already intervening quite heavily in the markets. It also highlights how the eurozone crisis continues to transfer risks away from private creditors to taxpayer-backed institutions. It remains unclear how the ECB would cover losses in the event of a sovereign default. - The ECB is likely to continue to keep interest rates low and continue to provide cheap credit to banks despite inflation fears in Germany. Currently, given the global slowdown, the different monetary policy needs of eurozone countries are small enough to paper over. However, this will not be the case for long and as German growth picks up the huge flaws in the one-size-fits-all monetary policy will again be horribly exposed. - Moving forward, the ECB could offer a liquidity boost to Europe’s economy but little more. The term ‘lender of last resort’ is often misused or misunderstood – the ECB cannot fully backstop sovereign states or return them to solvency. At best it could ease the pressure on illiquid states, but even this depends on the legal constraints on the ECB’s defined role and being seen to give in to political demands that would hurt the ECB’s credibility and independence. - Even if it can be achieved practically, Quantitative Easing (QE) by the ECB is unlikely to work. Even a €500bn bout of QE – as some have called for – would see only €90bn flow towards Italy, due to the need to spread QE evenly across the eurozone. This would not make a significant dent in Italy’s €1.9 trillion of sovereign debt. - Alternative options such as the ECB lending to the IMF or lending to banks for them to stock up on sovereign debt, are preferable to direct ECB financing of states, since the IMF and banks can apply some conditions and maintain market pressure for reform, but create hazards and complications of their own without offering many additional benefits. - Instead of arguing about the role of the ECB, EU leaders should focus on pushing ahead with debt restructurings in the eurozone, despite the ECB’s objections, and formulate a plan for how to mitigate the ensuing losses both on the ECB’s balance sheet and in the private sector. Ultimately, money would be far better used for these ends rather than flooding the eurozone with liquidity and recycling debt – both of which have failed so far. - The time may come when greater ECB intervention in the sovereign debt markets is unavoidable, but at this point it would be a mechanism to help ease the transition to a new eurozone structure, probably with fewer members and a more clearly defined role for the ECB. To read full briefing, click here. How will the UK judge the role of the ECJ? A draft of the new European treaty proposed by France and Germany has been leaked and attention has immediately turned to the thorny issue of the role of the EU institutions in enforcing or policing the new deal – remember the UK's line is broadly that they can't, a key source of potential leverage in future talks. NOTING that compliance with the obligation to transpose the "Balanced Budget Rule" into national legal systems at constitutional or equivalent level should be subject to the jurisdiction of the Court of Justice of the European Union, in accordance with Article 273 of the Treaty on the Functioning of the European Union. The Court of Justice shall have jurisdiction in any dispute between Member States which relates to the subject matter of the Treaties if the dispute is submitted to it under a special agreement between the parties. So this EU Treaty article clearly provides the new group with a hook on which to try and hang the new arrangement and get the ECJ involved. Article 273 would allow the ECJ to be used to judge a dispute (in this case whether the “balanced budget” rule has been adequately transposed), as long as the subject of the dispute is “related” to the EU Treaties. The question is whether this 0.5% rule can reasonably be seen as “related” to the Treaties. This is where the legal grey area begins and where it seems that the justification for ECJ involvement is iffy to say the least. The existing EU Treaties contain obligations for governments to remain within a 3% deficit limit and a 60% debt to GDP limit. But there is no mention of the new 0.5% “structural deficit” limit proposed by the new treaty. The 0.5% limit is a new obligation. It is therefore a legal stretch to say that this falls under the category of things to which the EU Treaty “relates”. Using the ECJ to judge whether this new obligation has been transposed properly is therefore also a huge legal stretch and one that the UK would be well advised to investigate and possibly challenge. If Cameron does wave the proposal through it will certainly raise political questions about what his veto actually achieved. "I would be a happy person if I know the answer to the following question: What is the future of the European Union?" “The attempted steps taken in Europe reveal not only the dysfunctionality of certain institutions and European principles, but how strong the disintegrative tendencies in Europe are…Poland can not become a part of the second or third ring… The biggest risk for Poland is the silent division of Europe…that the eurozone fixes itself and turns inward forgetting about the 27, soon to be 28." Tusk also emphasised that the decision about the new shape of the Union must not be a result forced through by three European capitals (he said it was not necessary to specify the capitals concerned, because everyone knew which ones he had in mind), but a decision made by the community as a whole. The Law and Justice and Solidarity Poland parties accused the government, and in particular Foreign Minister Radoslaw Sikorski (following his controversial speech calling on Germany to play a more active role in Europe) of betraying Polish interests and sovereignty. They were also very critical about the possibility of Poland offering financial assistance via the IMF to countries with a higher standard of living than that enjoyed by Poland. The clash of approaches was perfectly captured by the fact that Law and Justice MPs wore badges with the Polish flag, while MPs from the pro-integrationist Palikot’s Movement wore badges with the EU flag (pictured). Janusz Palikot, the flamboyant leader of Palikot’s Movement (yes he really did name his party after himself) well known in Poland for his use of props to illustrate his political arguments, want as far as to present Sikorski with the pen used by late President Kaczynski to sign the Lisbon Treaty in order to keep him on the path towards European Integration. The unease about the future direction of Europe is spreading fast. On Tuesday, we set out a country by country guide looking at the limited support in cabinets and parliaments around Europe for the main points of the deal agreed last week highlighting that the European match-up is far more complicated than "26 vs 1". The FT had a similar piece on its front page yesterday, and the Independent featured almost the exact same story on its front page today (which goes to show that you should sign up to our press summary if you want to stay ahead of the curve). So what about reactions from politicans and media around Europe to the veto? To be honest, there's been quite a bit of Cameron-bashing in the European press - some justified, but there's been plenty of ranting too. It's almost as if politicans and commentators finally saw a chance to divert some attention away from the constant fire that eurozone leaders have been under since the crisis started two years ago. Unsurprisingly, the Swedish and Irish Prime Ministers, have also both indicated that there are still plenty to discuss regarding the future of Europe, and that they expected the UK to be involved in this process. "[Polish PM] Tusk should learn from Cameron's diplomacy"
“Should the UK actually leave the EU, the Union would lose not only the cradle of European democracy, but also one of its founding members - and the most important financial centre of the old continent”. "David Cameron says no to a new European treaty, while listening to his English voters, and is accused of being someone who "blackmails" Europe. Twenty six other government leaders and heads of state don't give their parliaments but European bureaucrats control over their budgets...this kind of top down integration carries the risk that democratic support for the Union shrinks. Europe and democracy: for now they don't seem together. Unless you consider it democracy that elected leaders in Brussels agree upon common measures which they can't or don't dare to push through in their own countries." "[Cameron's] fear of European rules which would hit the heart of the British economy, the financial sector in London... isn't unjustified. It wouldn't be the first time that France and Germany are trying to get rid of competition elsewhere in the Union. French President Nicolas Sarkozy keeps on repeating that the City of London is at the heart of the crisis. It isn't of course that simple. The British have already cleaned up their banking sector better than the French and the Germans together." "That is now overshadowed by the darker figures of Angela Merkel protecting German interests, Sarkozy protecting French interests, and doing so with greater skill and duplicity than we have seen before. 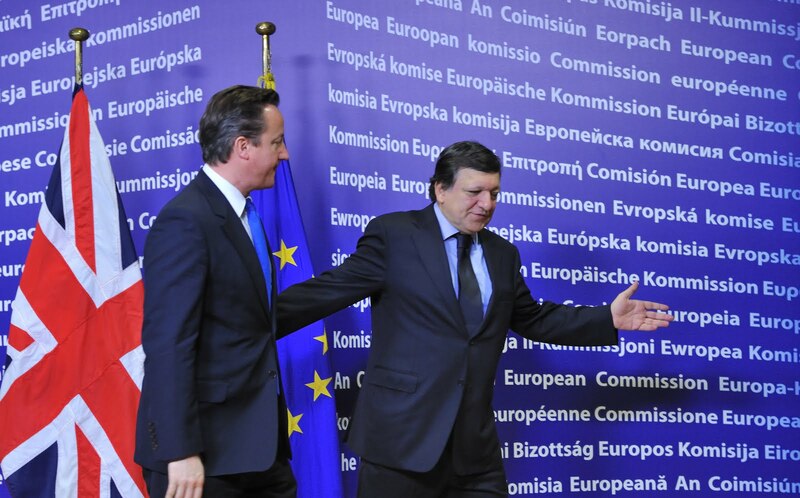 David Cameron has seen what this would do to British interests and backed away. We should do the same." "Even under normal circumstances it would have been hopeless to expect Cameron to approve the EU's conversion into a fiscal union as a first step towards political union without receiving anything to show for it at home. But given that the justification for this step was the rescue of a currency the logic of which the British still doubt today it was utterly impossible…It would be better now to focus on what the two sides still have in common and what can serve both their interests instead of ranting against the Britsh. And a functioning common market is right at the top of the list here." "From development cooperation to a European research area, many European projects would look very different today without the UK's influence. And it's difficult to imagine that without the UK the EU would have dared to break up hugely influential national monopolies like the telephone companies or airlines. If the UK leaves, the EU will lose not only military, academic and financial clout but also a country that has demonstrated that it is much better able to renew its public administration and policies than continental Europe"
All in all then, to paraphrase Mark Twain slightly, it could be said that reports of the UK’s death in Europe have been greatly exaggerated. For all those who think that French President Nicolas Sarkozy will be sitting in the Élysée plotting some form of retaliation against Cameron, it has quickly become clear that he has much bigger things to worry about. Rumours have once again been flying around that France’s triple-A rating is under threat and could be facing an imminent downgrade. These have become all the more serious by the numerous French government ministers that have publicly played down the gravity of any downgrade. This public onslaught by the government on the cost of France losing its triple-A rating is widely being seen as a way of softening up the public and the markets for what’s coming. Ultimately, the impact of a downgrade on France will depend on numerous factors, not least: whether other countries are also downgraded, whether it is a one or two notch downgrade and the level of upcoming public and private financing which France faces immediately after the decision. Since the EFSF’s Triple-A rating relies on Triple-A countries, a French downgrade would also mean a downgrade for the EFSF itself. For such a downgrade to be avoided, the remaining Triple-A countries would need to substantially increase their share of the guarantees, transferring even more of the burden on the already reluctant German taxpayer – while also threatening Germany’s own rating. In all likelihood, under the increased EFSF scenario, a downgrade of France would trigger a downward spiral of ratings cuts due to the extra EFSF liabilities which would make the entire fund completely unworkable. So a French downgrade would be bad for the EFSF, the eurozone’s temporary bailout fund, while numerous downgrades could spell the end of its ability to borrow, and therefore lend, at low cost. It could also spell trouble for the ESM, the eurozone’s permanent bailout fund, which, despite some paid in capital, also largely relies on guarantees from its members. In any case, the French government may be softening up its population for a downgrade, but who’s going to soften up markets for the realisation that the eurozone bailout funds could be rendered close to useless (more useless?)…. Christian Noyer, Governor of the Bank of France, today launched an attack on the rating agencies (and the UK), suggesting that they are not basing their decisions on economic fundamentals and if they were the UK would/should be downgraded before France. Noyer raises some valid concerns about the level of the UK's debt, deficit, inflation and the dwindling credit availability - but he, like his colleagues mentioned above, misses the key point. The UK has full control over its own monetary policy and can balance it with its fiscal approach in any way desired. France however faces: a central bank whose thinking runs completely contrary to the government's desires, an overvalued currency, increasing fiscal constraints due to its exposure to the eurozone crisis and a looming election (along with potential political divisions over the eurozone crisis). All in all, the UK may economically be in just as bad a position as France, but the UK has the tools to deal with its problems, the French government is, on the contrary, massively constrained. So what does business really think of Cameron's veto? Cameron's use of the veto at last week's summit, in order to seek a level playing field in the single market, allow for stricter bank capital rules and unanimity on the transfer of powers to the EU's financial supervisors, has been followed by the usual arguments that the business community is concerned that the UK will be isolated (see here why the issue is slightly more complicated than that) and that it fears for the UK's place in the single market. This 'argument by anecdote' is one that we've heard so many times before, and the last few days has seen a number of exponents of it. "while others within the banking community and beyond said the decision risked destroying the country’s position as Europe’s pre-eminent financial centre." "It was hard to find many business voices supporting the decision this weekend"
"It seems clear to me that the City's interest is in a truly single European market, not a fragmented patchwork." "Business clearly wants a deepening and widening of the single market and that is what our message is in terms of wanting to see greater reforms. We are not defending the status quo, we are trying to see a changed and reformed Europe." Yes, of course we're all in favour of trade and growth, but let's think a bit deeper about this. Cameron's efforts last week, whatever you make of the tactics and if he asked for the right thing, were an attempt to achieve reform in Europe, through more local ownership of supervision and capital rules for banks, for example. So surely, what's interesting is what business really thinks about the basic aims. And what does it actually think about the single market? Well, you're in luck, because this morning we published a new ComRes poll designed to inject some substance into a debate that has so far been based on hearsay. 500 financial services professionals were polled between 28 November and 7 December, before last week’s EU summit. So this poll is about the general sentiments on the EU negotiations, a UK 'veto' over financial services and attitudes to the cost/benefits of EU rules and market access. At Open Europe we maintain that access to the single market has by and large been beneficial for UK businesses, which is why we were very surprised to see such a large share in the business community expressing such qualified support for it. We were keen to qualify our key 'veto' question by flagging up that such a tactic could compromise market access. This point is vital, as a substantial chunk of the media narrative in the last few days has been that the business community now perceives itself as worse off than before the summit (again, this is the narrative not necessarily the reality). But our poll would suggest that this is a risk that businesses are actually willing to take - which again, surprised even us. - Overwhelming support for a UK veto on EU financial regulation even if it reduced market access to the EU: The ComRes survey finds that 69% of financial services professionals say that they would support the UK having a veto on future EU financial regulation and other financial measures, even if it risked reducing their firm’s market access to one or more EU countries. - Concerns about the cost of EU regulation: The poll finds that 56% of financial services professionals think that, on balance, the costs of EU financial regulation currently outweigh the benefits of the Single Market to the City, while 31% disagree. Over the next five years, 62% expect the costs of EU regulation to outweigh the benefits of the Single Market, while only 24% disagree. - 70% think the UK should renegotiate the EU Treaties to safeguard the City: While the Single Market is seen as important, surprisingly, a full 70% think that the UK Government needs to renegotiate the existing EU Treaties to safeguard the City of London, limiting agreements to trade and association only. - Eurozone-only financial transaction tax (FTT) would have a negative effect on finance firm’s UK operations: Given that the UK and other non-euro countries are opposed to an EU-wide FTT, the likelihood of a eurozone-only FTT being proposed has increased. If the eurozone went ahead with its own FTT, without the UK, finance professionals think this would still have a negative effect on UK firms. 55% say it would have a “negative effect” on their UK operations. If an EU-wide FTT, including the UK, was introduced, 48% of financial services professionals say they would consider moving some of their activities to outside the EU. - UK regulators are perceived to have a better understanding of financial markets than EU regulators: In contrast to EU-level regulation, financial services professionals are less likely to agree (40%) that the costs of UK-derived Financial Services Authority (FSA) regulation outweigh the benefits, than disagree (47%). Only 22% of respondents agreed that the EU institutions have a better understanding of how financial markets operate than the UK’s FSA, while 62% disagree. As our survey and the graph above clearly demonstrate, in financial services in particular, a key sector of the UK economy, a majority already believes that the cost of complying with existing and new EU regulations outweighs the benefits of access to the single market. And even more are concerned that this will be the case in five years time. See a full summary of the poll here. In our press summary yesterday, we flagged up how Sarkozy's and Merkel's pact is far from a done deal (if anyone for a second thought so) as Parliaments and governments around Europe continue to struggle to come to terms with its details and content. On their respective front pages today, the FT and the WSJ are picking up on this theme as well (which goes to show that if you have not yet done so, you may want to sign up to our daily press summary featuring the key stories from all around Europe). Over on the Spectator's Coffee House blog, we take a closer look at the state of play in various EU countries in the context of the "26 vs 1" narrative and the UK isolation hysteria that have swept the UK media over the last few days, following Cameron's veto (the isolation hysteria is sort of the equivalent of the scare story - peddled by some eurosceptics - that Germany is set on becoming the 'fourth reich'). Judging from much of the coverage in UK media, you would be forgiven for thinking that Britain is on the fast track to becoming the North Korea of Europe — eccentric and completely isolated from the rest of the world. Indeed, the media narrative over the past couple of days has largely treated the agreement reached at the summit as concrete, supported in full by everyone apart from Britain. Or ‘27-minus’, as Commission President Jose Manuel Barroso put it. The reality, of course, is quite different. Leaving aside whether Cameron could have played his cards better (he could have), as Gideon Rachman pointed out in yesterday’s FT, ‘the picture of an isolated Britain’ will become blurred as the rest of Europe grapples with the Merkozy deal. So let’s have a look at the level of support in cabinets and parliaments around Europe, for the deal’s main points: fiscal integration, stricter EU budget rules and sanctions, new rules for the euro’s permanent bailout fund (the ESM) and fresh cash contributions to the IMF. France. For all the Sarkozy rhetoric, his main rival, the Socialist candidate Francois Hollande, leading him by 18 per cent in a hypothetical second round clash, has said that: ‘If I'm elected president, I'll renegotiate this deal...to add to it what it lacks today’, being particularly critical of constitutional limits on budget deficits. Germany. Scratch the surface and the Germans aren’t overwhelmed either. In addition to the deal being seen as an insufficient to solve the crisis, the Bundesbank has warned that the proposed new IMF contributions could take Germany above the ‘bailout’ ceiling established by the Bundestag. Denmark. The Merkozy deal appears to have split the newly-elected Danish centre-left coalition. Danish Foreign Minister Villy Søvndal (of junior coalition partners the Socialist People's Party), and PM Helle Thorning-Schmidt ( Social Democrats) have been accused of contradicting each other over whether the pact could restrict the government from pushing through its economic programme. The agreement is now pending analysis and approval in Folketinget, which will also consider whether a referendum is required (it’ll most certainly be avoided). A poll this week found that 54 per cent of Danes want the pact to go to a public vote. Sweden. The Swedish minority government looks unlikely to get the necessary majority to get the package, as it stands, through the Riksdag. The leader of the opposition Håkan Jurholt has warned against becoming euro members ‘via the backdoor’. The centre-right coalition remains split on the issue, with PM Fredrik Reinfeldt saying that it would be a ‘bit strange’ for the country to join. Meanwhile, Swedes are becoming increasingly sceptical. A fresh poll out this week shows that over 80 per cent of Swedes would vote ‘No’ to the euro in a referendum, compared to 42 per cent two years ago, while support for EU membership has dropped from 55 per cent to 47 per cent in a year. Poland. Opposition parties Democratic Left Alliance and the Law and Justice parties have warned that the deal would violate the Polish Constitution, and therefore needs a two-thirds majority in both houses of the Polish Parliament, which is far from guaranteed. Law and Justice has even threatened to over-turn the agreement once in power (which, it should be said, can be a while). The government maintains that the pact actually won’t impact on Poland until it joins the euro. Finland. The Grand Committee in the Finnish Parliament has launched an inquiry into whether the country’s Prime Minister Jyrki Katainen potentially over-stepped his mandate in the negotiations in Brussels last week. In its current form, the deal is unlikely to pass Parliament as the majority rule for the activation of the ESM (meaning Helsinki will be stripped of its veto over future bailouts) will require a two-thirds majority in the Parliament to be compatible with the country’s Constitution. Such super-majority looks unlikely since the main opposition parties the Centre Party and the Finns (previously ‘True Finns’) both oppose the deal. Czech Republic. Prime Minister Petr Necas told the Czech press, ‘It wasn't possible to sign up to this international agreement for a number of reasons. But the main reason was this – nobody knows what's in it’, saying that the deal will need approval form his Parliament. In addition, the Czech Finance Minister Miroslav Kalousek yesterday said that the suggested additional IMF contribution is ‘extremely high,’ estimated by the Czech Central Bank to be equal to 10 per cent of official Czech reserves, something echoed by Czech President Vaclav Klaus. Hungary. Hungarian PM Viktor Orban will let the Hungarian parliament decide whether to agree to the deal, although with his Fidesz party enjoying a solid two-thirds majority, he could in theory easily push it through should he want to. Netherlands. The situation is not fully clear, with the Social Democrats appearing to have backtracked on their previous request for early elections to be called if further transfers of sovereignty to the EU were to take place under last week’s agreement. With the Social Democrats, the government would have the majority needed to push through the agreement. Ireland. Ireland will decide whether it needs to be put the agreement to a referendum when the details of the agreement are clearer (probably March), with chances for a vote seen as 50-50. Deputy PM Eamon Gilmore also said that ‘I believe there will be a lot of discussion on that between now and March. I will be surprised if Britain is not involved in that discussion’. Estonia. The Finance Ministry has said that the country will not contribute to the agreed €200 billion IMF capitalisation, even though the country is a member of the eurozone. So is it fair to reduce this myriad of opinions and political positions to a 26 versus 1 discussion? You decide. What could Cameron hope for? And the question would be....? 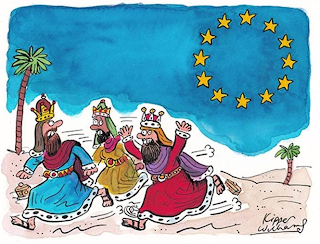 A disturbing glance into the future of Europe?